Montana is home to a lot of different species of fish, but by far the most famous of these is the trout. Every year people from all over the world come to Montana to fish for trout. Now the word trout is a kind of funny thing scientifically, it means a certain species of fish that come from Eurasia. But commonly people use the word "trout" to refer to two other groups of fish, the salmonids and the char. Montana’s trout species include rainbow, brown, brook, lake, bull and cutthroat trout. Cutthroat, rainbow, bull, and lake Trout are Montana’s native trouts, which means that these species were discovered living in Montana’s waters, although many of these species were introduced into waters that were not their native range. The fossil record indicates that native trout have lived in our creeks and rivers for a long time. Other fish like grayling and mountain whitefish are also native to Montana and are close genetic relatives of the salmonids. European settlers and their descendants introduced the other species of trout in Montana. These include golden, brown, and brook trout. Trout are opportunistic feeders, which means they will eat a lot of different things to stay alive. 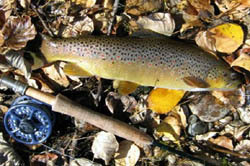 All trout particularly like to feed on aquatic insects, like the larval stages of mayflies and dragonflies, called nymphs, and freshwater crustaceans like scuds. They also like to eat insects that live on land but sometimes fall into the water like grasshoppers and ants. Also, large adult trout can be piscivorous, a Latin word that means fish-eating. Trout lay eggs each year during their spawning seasons. For rainbow and cutthroat trout spawning happens in the spring. The fish start beefing up on food in the early spring and then begin laying eggs in late spring. Brown, bull, lake, and brook trout, on the other hand, all spawn in the fall. Trout will actually search out a tributary, a smaller stream or creek that runs into the river or lake they normally live in, to spawn. Young trout are particularly vulnerable to being eaten by other fish when they hatch because of their small size. For this reason young trout will live in the tributary in which they were born and tend to seek out shallow water until they get large enough to fend for themselves in larger waters. A trout grows in relation to the environment it lives in. For example, a trout living in a river with good mineral content that supports lots of aquatic organisms will grow much faster that a trout living in an alpine lake where the winter lasts much longer. Water quality is also important for the growth of trout. A stream free of pollution and other environmental impacts will support lots of large healthy trout, while a stream polluted by industry will not support hardly any healthy trout. Trout are a very popular game fish. 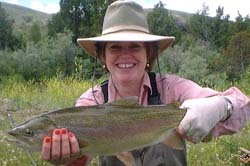 The most popular trout to fish for in Montana’s rivers are rainbow and brown trout. Fishing methods vary with the season, the type of water, and the fisherman’s personal preference. Fly, spin, and bait fishing are all popular techniques, although the use of bait is restricted on some streams. In general, most fly fishers use rods that are eight and a half or nine feet long, while spin and bait fishers use shorter rods with six to ten-pound test line. Wading is the most common technique along streams and rivers. Hip boots are handy on small streams, but chest waders are needed on the large rivers. Felt-soled wading shoes or boots improve traction on slippery stream bottoms. Float fishing is increasingly popular on the largest rivers, but some rivers can be dangerous in high water. Inexperienced floaters always should inquire locally about river conditions and possible hazards. The best floating craft are McKenzie-style drift boats or high-quality inflatable rafts with rowing frames. Motorboats are allowed on most lakes and on some larger rivers; smaller lakes and rivers may have restrictions on motorized watercraft. Motorboat operators should always be alert for fast-moving storms and strong winds, especially on large reservoirs such as Fort Peck. Children under twelve must wear a personal flotation device (PFD) at all times while boating or rafting; adults are encouraged to wear PFDs. Over the years some trout have been placed in danger by dams and other habitat alterations, the introduction of non-native fish, disease, and over-fishing. The westslope cutthroat trout, Yellowstone cutthroat trout, and grayling that once filled western Montana waters are now scarce in most of their native ranges. Recognizing the need to save Montana's native species, state fishery biologists have listed westslope cutthroat trout, Yellowstone cutthroat trout, and grayling as "species of special concern." Research and management programs are now being developed to save these fish. The cooperation of fishermen and industry in complying with special regulations governing Montana's native fish will be vital to these trouts’ survival.